You Bought A Journal.. Now What? Journaling is all the rage right now. Drawing, doodling, quoting, dreaming, praying…. There are countless options to choose from. If you are an artist at heart there are blank pages and coloring pages. If you are a bit type-A (like me) there are grid pages and dot pages. So if you have crossed this first threshold then I commend you! It took me months to figure out my best-suited method! 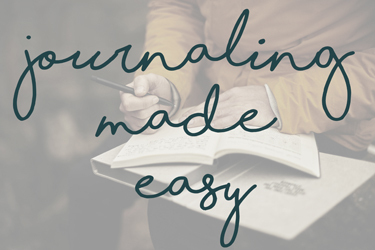 The benefits of journaling are hard to argue. Show me one person who couldn’t stand to know themselves better, cope with loss and poor choices better, be more grateful, more understanding, more intellectually keen, more productive. Whether you are using your journal to map your way out of the darkness or map your way into success that inexpensive book of empty pages will soon become letters, words, paragraphs of priceless insight. Unlocking doors to rooms in your mind that you didn’t even know were there, let alone that the key was on your keychain the whole time. My current journal of choice has lines. Just lines. I know. It shocked me too. I live my life in full-color, creating shapes and images and music at all times… yet my journal is full of lines and words. Prayers actually. I keep it with me all the time. I write/pray when I’m grateful, when I’m disappointed, when I’m helpless and feeling desperate… But my favorite part is reading it back. At the beginning of each week I read it from front to wherever my pen landed last. Along the way I draw a tiny heart above the prayers that God has answered… big hearts above the ones He answered with more than I asked for. One of my biggest failures is recognizing and remembering how much God loves me and that He is on my side, working in my favor. I was quick to forget or failing to even notice the small things and allowing the big things to be outweighed by the latest bump in the road. Having all that evidence staring me in the face… there is no question. I am loved. My husband is loved. My kids and my family are loved. Whatever your hindrance may be… there is a journal to help you. There is a list of topics to guide you. There is a method to break through the ceilings and limits you have put on yourself. Pick up a pen, a pencil, a keyboard and write or draw or doodle your way to that next level! I believe in you! 1. Find your method to the madness. There’s no harm in trying a few types of journals out… you may toss one aside and pick it up down the road. 2. Tools of the trade. Markers, pencils, ink pens, water colors… experiment and stock up on options. 3. Set a reminder. Nothing in my life happens if my magic iphone doesn’t tell me to do it. I have reminders for everything! I’m for real… from bills to baseball games… it only takes a few moments to set a reminder that will chime everyday at the same time! 4. Channel your inner Mary Poppins. Keep that cute little book in your bag! Take it with you wherever you go to ensure you never miss an opportunity to document an important moment or ensure you never forget a brilliant idea! 5. Rules are made to be broken. These pages are for your eyes only! That means there are no mistakes! No rules! Nothing too harsh or inappropriate or embarrassing exists! Shake off your inhibitions and fears and just write! 6. Rewind the clock. Take time to read and reflect on what you have written… there are so many lessons to be learned from ourselves. 7. Twerk while you work. BE FREE! Dance in the shower, belt it out in the car kind of free!